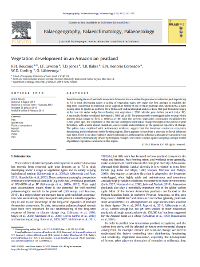 “Vegetation development in an Amazonian peatland” by Katy Roucoux, Ian Lawson, Tim Jones, Tim Baker, Euridice Honorio Coronado, Will Gosling and Outi Lähteenoja has been published in the journal Palaeogeography, Palaeoclimatology, Palaeoecology. It presents our first pollen diagram from Peru, charting the development of the Quistococha peatland over the last three millennia. The article is online here.